Hunkering down in the Skyline Serpentine Prairie Preserve on the western edge of Redwood Regional Park that overlooks Oakland, I carefully combed through the dry plants looking for seedpods of the Presidio clarkia, an endangered plant. Our team’s mission was to help the small annual flower re-establish and expand its territory. 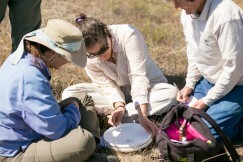 Instructed by Lech Naumovich, a plant restoration expert from Creekside Science of Menlo Park, we looked for clusters of the clarkia and counted every 20th seedpod, which we collected into envelopes. In the afternoon some areas within the serpentine prairie preserve would be raked and the seeds redistributed where conditions were right –- thin soils and low thatch overgrowth –- for the plant to germinate in a larger area next spring. The bluish-gray serpentinite rock occurs in subduction zones where oceanic and continental plates collide (and it's our state rock,too.) The weathered serpentinite is a poor soil for plants, but surprisingly is a good thing for some native plants. Competition from non-natives is vastly reduced and native plants adapted to this soil can thrive here. Though serpentine habitat is found around California in the Coast Ranges and Sierra and can even be found in areas around the U.S., the serpentine prairie grassland is one of the most endangered habitats and supports about 13% of California’s endemic plants. 19 species of native grasses and one of the most spectacular spring wildflower displays are found here. Much of the original Skyline Serpentine Prairie was lost to development. A small remnant, six acres, is now protected by East Bay Regional Park District. Prior to the restoration project, begun in 2009, the prairie in the park was being loved to death by dog walkers, horseback riders and hikers. There were also trees planted there in the 1960s, which were enriching the soil with too much leaf litter and altering the characteristic serpentine soil composition, making it much easier for non-native weeds to grow here. In 2009, a fence was installed to protect three acres of the most highly impacted portion of the prairie and in succeeding phases, trees were removed and habitat management plans were enacted to bring back the prairie. 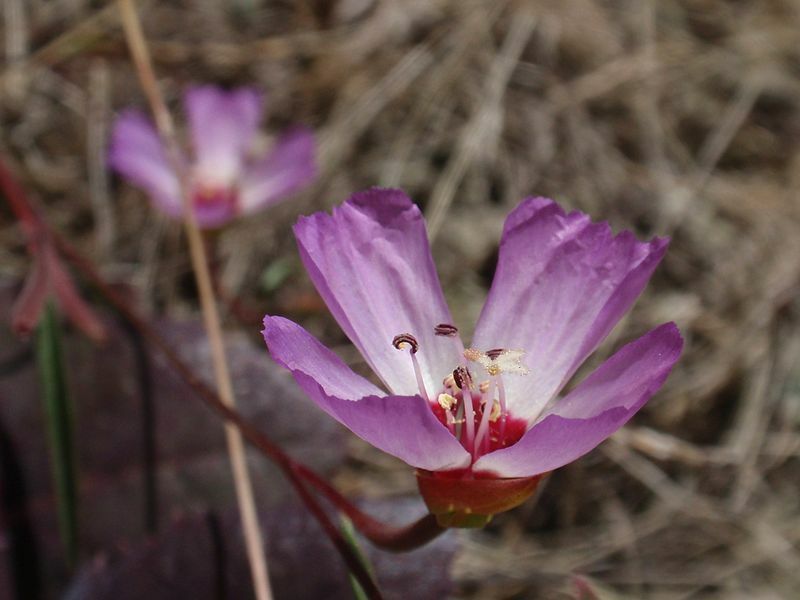 Our work to collect Presidio clarkia seeds and spread them more broadly was just one small step in the multi-year plan to protect and nurture a vital piece of California’s legacy for future generations. 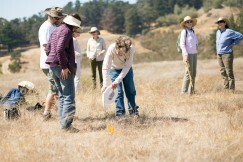 To find out more about the project, visit the East Bay Regional Park District’s website.